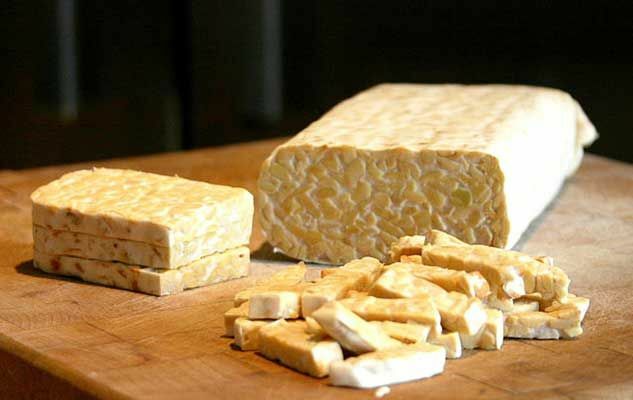 Originally from Indonesia, tempeh is obtained from soya beans, which are cooked, pressed into patties and cultured with a fungus (rhizopus oligosporus). Fermentation takes place for 24 hours at 30°C: mold then forms (white mycelia, like on certain cheeses) and transforms the patties into a compact white-ish edible “cake”. The flavor of tempeh is mushroomy, nutty and yeasty, and its texture is both firm and crunchy. It is sold sliced and available in a variety of flavors (plain, marinated, smoked, with seaweed or including grains or cereals). You can find it in the chilled organic section in health food shops. Tofu and tempeh contain complete proteins, with all the essential amino acids. What’s more, for the same amount, tempeh contains 20% more protein, which is comparable to animal sources of protein. Fermentation makes tempeh more easily digestible. Containing at least 5g of fiber per 100g, tempeh is a source of dietary fiber, contrary to tofu and meat which do not contain any. Tempeh also contains good monounsaturated and polyunsaturated fats and only 157kcal per 100g portion. Fermentation also increases its mineral content: three times more potassium and copper, and double the amount of phosphorus and magnesium compared with tofu. Tempeh also contains more vitamins, such as niacin and vitamin B12. However, the quantity of bioavailable vitamin B12 in tempeh is limited and isn’t comparable to that found in animal products. Tempeh is mostly sold chilled, in a compact square patty around 2cm thick. The price is around $5 for a 240g packet. It keeps a week in the fridge and several months in the freezer. Tempeh must be cooked before being eaten. Like tofu, tempeh is more flavorsome when it is marinated or seasoned. It can be sautéed, grilled, steamed, minced or added to sauce dishes once it is cooked.